Have I mentioned that I am now in love with watercolors? Oh, I do love the pretty effects of mixing colors and less-than-perfect is what is beautiful. We've been using them in Art Class and I haven't even tried all the techniques yet. So much fun in such an inexpensive package. 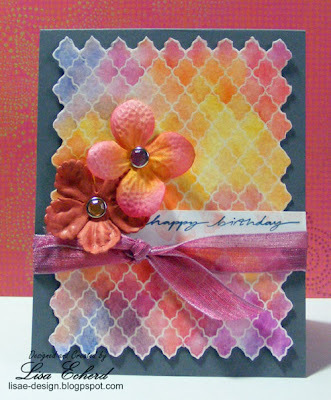 For this card, I CASEd two different cards using the lattice background stamp from Hero Arts. This one from Mary Dawn has the pretty hand cut edge which I thought was an ingenious take on this stamp. And this one from Jennifer McGuire uses distress markers to color in each of the little space. I used warm color watercolors over the embossed image. The colors ran into other spaces. I'd then dab a bit more on and get layers and layers of pretty colors. I can't tell you how long I sat at my worktable coloring this and I loved every minute of it! The background is Stampin' Up! Basic Gray as a not-too-stark neutral for the warm colors. 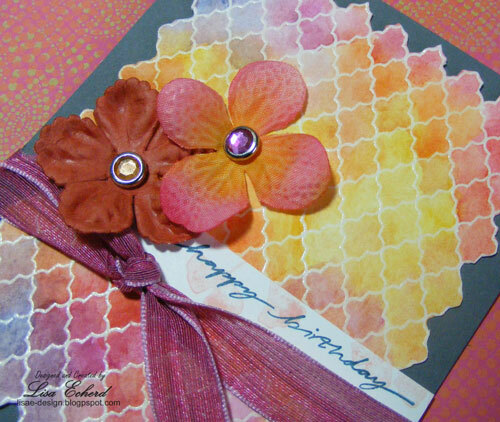 The card got a very simple finish with some silk flowers and ribbon. Now off to work so I can have some time to play later on! I have so many crafty things I want to do this weekend. Hope you have a great first weekend in March. Lovely card, Lisa. I, too, have made several card fronts using a similar technique, only I used distress ink. I haven't finished the cards yet, but I'll post them to my upcoming blog just as soon as I get them ready. Hugs! The water color is lovely! And I'm totally impressed with the hand cut edge of that background.